GLR Amelita is the only 4P Condor daughter we have managed to keep for our own herd. She without question has been one of Brad and Jandy's all time best producers of champion colored offspring. She is a high luster, tight penciled rose grey appaloosa female with striking presence. She placed second at the 2004 AAA Futurity, 5th at MAPACA 2004, 2nd at AOBA & 1st at MIAF. In 2005 GLR Amelita was the AAA Futurity Grey Color Female Champion. 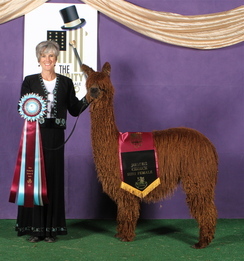 GLR Amelita's dam, GLL Alita was well known throughout the industry for producing elite cria for many many years. GLR Amelita's 2006 cria is GLR Coyhaique, a grey appy Synergy son who won the Grey Suri Color Championship at the 2007 AAA Futurity, was first in his class at the 2007 AOBA Nationals as a juvenile and won Reserve Grey Color Champion.He is now co-owned with Shasta Springs Alpacas. Her 2007 cria was yet another gorgeous dark silver grey appy son, GLR Kolaqua. 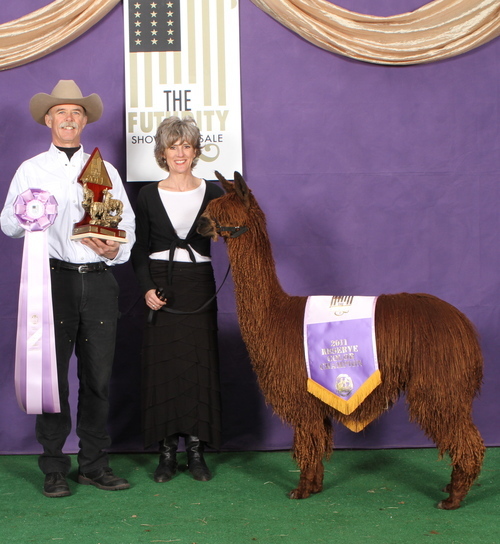 GLR Kolaqua was third in his class at the 2008 AAA Futurtiy and won Grey Male Color Champion at MAPACA 2008, the biggest alpaca show in the nation, and Grey Male Color Champion at the 2008 and 2009 AOBA Nationals. He is one of our best producing studs here at the ranch. GLR Amelita's 2008 cria, GLR Atacama another Grey Color Champion is now owned by Linda Kondris of Pines Edge. Amelita's 2009 cria, GLR Annalisa, another Synergy daughter is a lustrous beautiful fawn female who sold at the AOBA Auction in Indiana. Amelita's 2010 cria, GLR Blackout, a Shavano son was the MAPACA Black Male Color Champion, Judges Choice, AOBA Nationals Champion all as a juvenile and then went on to win the Suri Network's Black Champion the next year. Amelita, had a female cria , GLR Amayah, sired by GLR Picasso, who is one of the best cria they had out of their 2012 crop of kids and earned a great show record at the three largest and most prestigious shows of 2013, finishing up the season as the Reserve AOBA Brown Female Color Championship, behind our own GLR Tessa who was Champion. 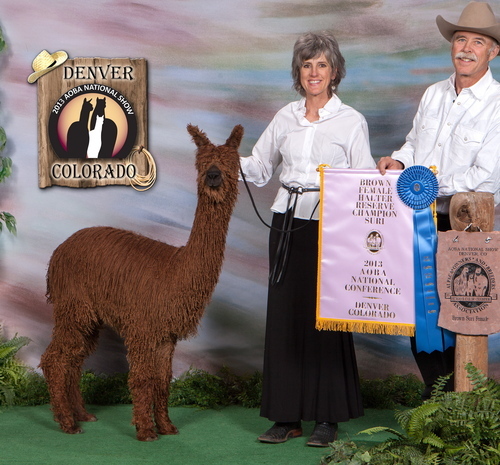 GLR Amayah, a member of their 2014 show string earned the 2014 AOA Nationals Brown Female Color Championship, the 2014 AAA Futurity Judges Choice and Brown Female Color Championship, the MAPACA Color Championship and the Suri Network Brown Color Championship. 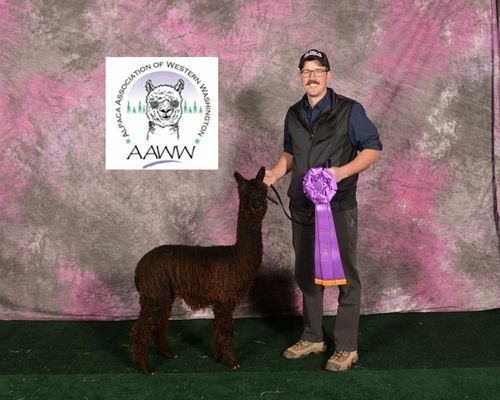 Amelita's 2013 cria is a dark brown female sired by Rastamon, GLR Amita who is a member of a 2014 show team and sold at AOA Nationals in Harrisburg. Her 2014 cria is a female modern grey appy GLR Amalia sired by Rastamon who hit the show ring in spring 2015 ending up her season, winning the Suri Network Grey Champion as just a juvenile. 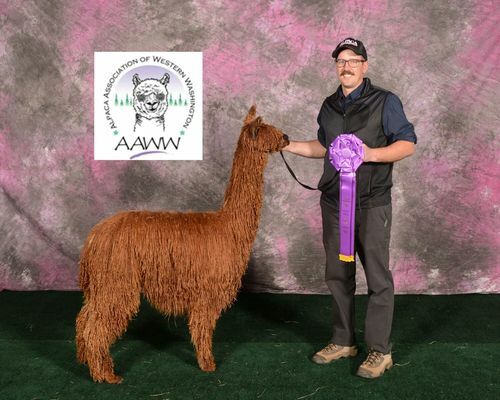 Her 2015 cria, sired by Picasso and a full brother to GLR Amayah is GLR Austin who was at the top of his class at AOA Nationals, the AAA Futurity and the 2016 Mapaca Jubilee. Amelita is bred back to CInders, the 2016 Dark Herd Sire of the Year and expecting a 2016 cria. Producer of multiple Color Champions and two Colored Judges's Choice offspring, Amelita is one of our best foundation females. GLR Amayah is the first offspring Brad and Jandy had on the ranch from GLR Picasso. She is notably at the top of the list of their favorites for their 2012 crop and earned a place on their show string. Her mother was a Grey Color Champion at the AAA Futurity and also the mother of GLR Blackout who was a multiple color champion and a judges choice in his first year of showing as a juvenile. Picasso, Amayah's sire, was one of the first Shavano sons they had and was a Champion himself. Picasso's mother, Rockstars Peruvian Paloma , was a mulitple color champion and has been one of our best producers over the years of award winning cria with excellent fiber characteristics. This girl has a beautiful head, full coverage, a full beard and beautiful luster, lock and conformation. She has no MacGyver in her pedigree on either side. She showed at the three biggest shows in the 2013 show season and was second at both the AAA Futurity and the 2013 MAPACA Jubilee, going on to win Reserve Brown Female Color Champion as a juvenile at the 2013 AOBA Nationals. Amayah in 2014 was the AOA Nationals Brown Female Color Champion the AAA Futurity Brown Female Color Champion and was selected as the 2014 AAA Futurity Judges Choice. 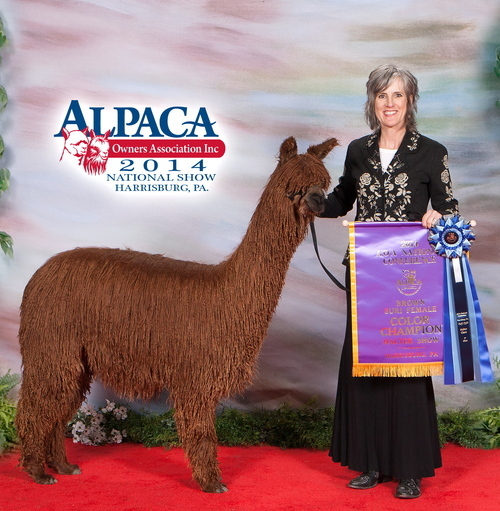 She was also the 2014 Suri Network Brown Color Champion in Estes Park. Bred to Cinders, her fist cria was a beautiful fawn female GLR Annapurna who was purchased by The Midnight Moon Alpaca Farm at just three months old. Her second cria, GLR Avallon, is a beautiful brown female that placed 1st at the 2017 Futurity. In 2017, she had her first black offspring, Zoltar of Halo. Look out for this boy as we expect him to follow in both his mother's and father's footsteps! She is bred back to Cinders and expecting a summer 2018 cria. CInders is the 2016 and 2017 Dark Herdsire of the Year and is closed to outside breedings. 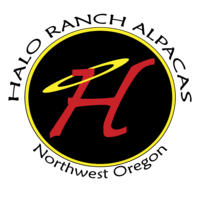 Bred to Granite's Tribute to Roy!